Twitter is being overrun by (Kevin from the Jonas Brothers birthday tweets) and a message called 'Keep The Wave Going'. 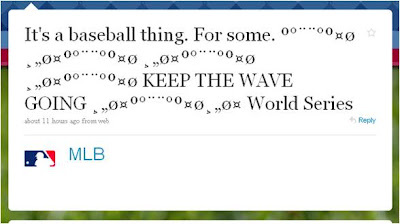 The 'Keep The Wave Going' tweet is designed to look like a stadium wave / Mexico Wave and was tweeted last night by @MLB shortly before the Yankees completed another World Series triumph. This Keep The Wave Going message is being extensively retweeted and remixed and continues to dominate Twitter. The initial appeal was obviously to baseball fans as the World Series came to a close and 9 out of 10 trending topics on Twitter were baseball related. However, the interesting thing is to look at how the 'Keep The Wave Going' message continues to spread with different ideas attached to it eg NEW KIDS ON THE BLOCK or ❤ symbols. This gives a good example of how messaging is re-interpreted as it spreads across the internet. It also seems to show that in this case people seem to be motivated to 'Keep The Wave Going' because they like the creative execution, more than perhaps they like the message itself? I wonder if anyone else will try to spread picture based tweets - this idea is surely ripe for an advertiser hijack?